I have always adored Halloween. I think it probably has a lot to do with the fact that during my formative years my mom took the time to make costumes for all three of us (and usually also for herself and my dad) from scratch – and they were always of our own choosing. We’d all make a special trip to the (usually boring) fabric store with renewed interest, ready to pick something amazing from those big floppy pattern books. In the first grade, the most amazing thing I could think to be was a dinosaur. And my mother, bless her heart, obliged her tomboy with the felt creation you see above. However, you’ll also note that she added two bows and a bit of lipstick. You know, maybe it’s high time for a repeat. Beautiful! and what a great mom! Those costumes are AWESOME!! We’re doing Trunks for Treats this year at our church, and I think I’m dressing up as the tooth fairy and sporting a set of those serious Halloween choppers. Eh… I don’t really know yet. The dinosaur was fairly easy to make. There was that one year that we were: Snow White, Gepetto and Pinocchio, Dorothy, and Rainbow Bright! Making costumes is in the “Mom” job description, isn’t it??? I’m not sure if it’s a requirement, but you definitely earned extra credit, Mom! 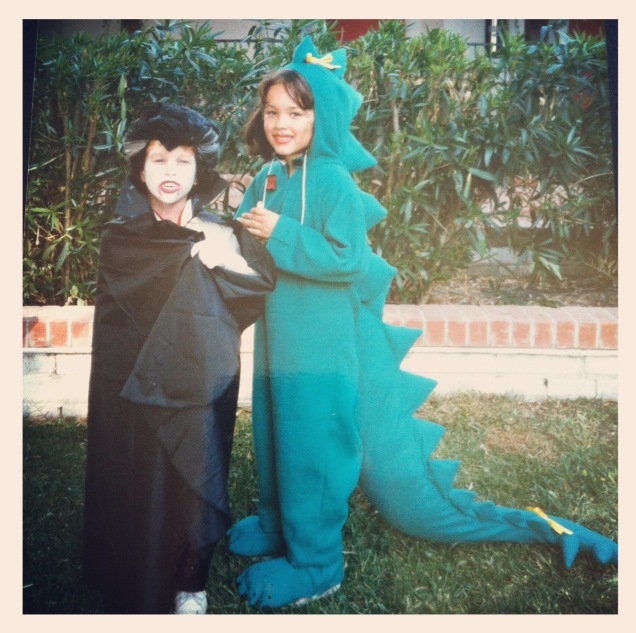 You are currently reading Throwback Thursday || Halloweenasaurus Rex at Quite Continental.